Today's post is all about reflecting...in more than one sense! This week is going by quickly and tomorrow is my last day of work since I am taking off Friday to attend my niece Taylor's college graduation. She is graduating with her Associate of Arts degree on Friday and she graduates high school at the end of May. Such a blessing to be able to earn an AA degree for free these days while you are in high school. She's off to the University of Florida in the fall and I am super proud of this beautiful young lady! Taylor was the first baby I ever saw being born and her delivery was pretty frightening. I won't share the details, but I did not think she was alive when she was born..so scary. But...as you can see, she lived and is an amazing girl. So hard to believe that was almost 18 years ago...she graduates two days before her birthday from the same college her mom graduated nursing school from the day before she was born. Her dad took her senior pictures...aren't they awesome? 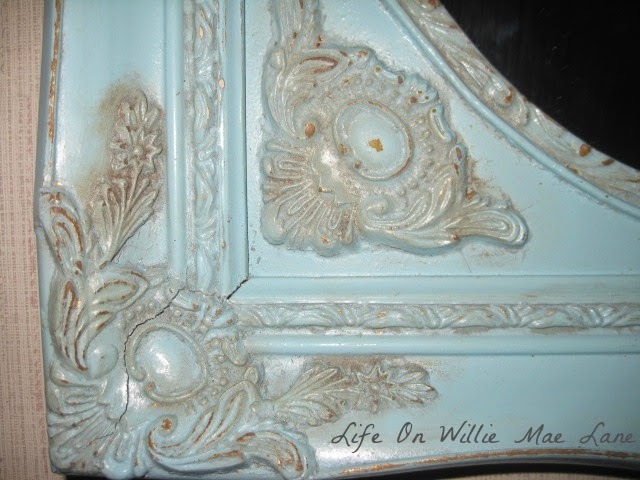 I have two mirror makeovers to share today as well. 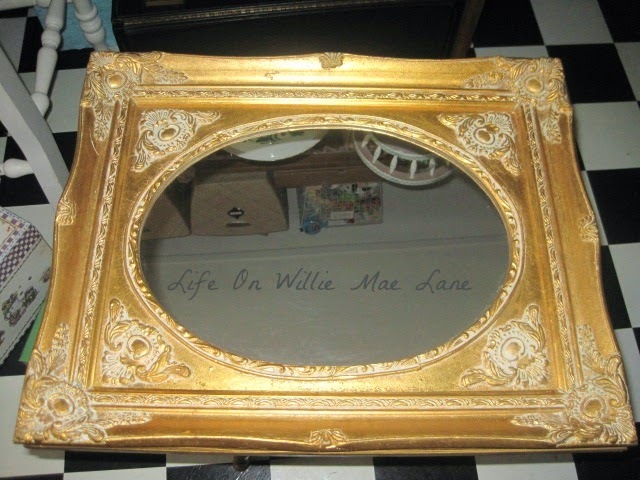 First up is this mirror that used to hang on my living room wall. It was a $1 thrifty find given to me by my sister, Nancy (Taylor's mama). She just knew I would love it! It used to be a clock, but I added a mirror and jewels to the front instead. I gave it a new paint job and it is now hanging in my bedroom. I love the new color! 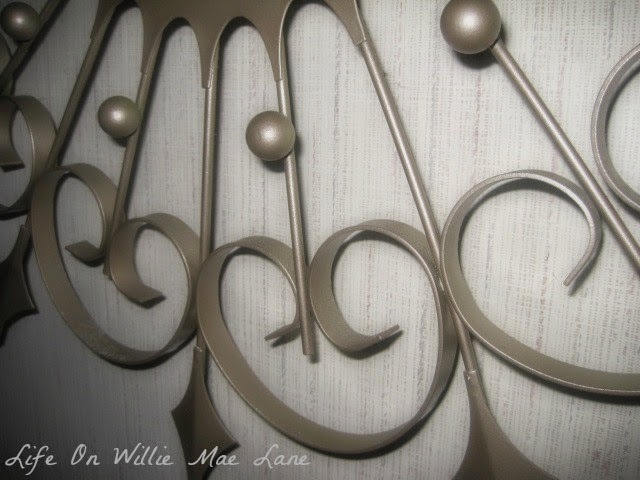 The design around the edges reminds me of a heart...love it! Next up is this gold mirror I bought a couple months ago. 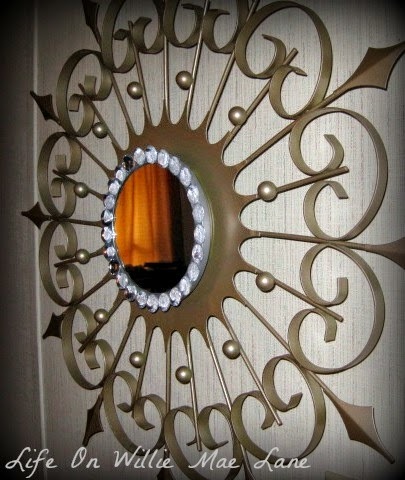 I fell in love with the ornate details and I love the oval shape that frames the mirror. 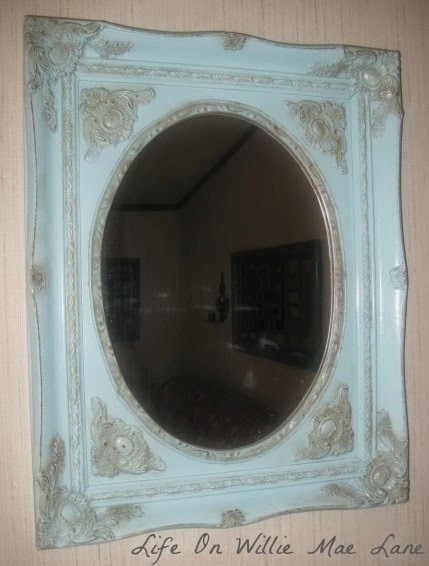 It took the place of the mirror I just shared that moved to my bedroom and left an empty spot on the living room wall. Can't have that...lol! Anywho, I like it in aqua..but I don't love it and will most likely redo it again soon. I sanded it a bit to give it some dimension but am still not thrilled with it. I don't know why...:( I also don't like the cracks that showed up when I painted it. I did not see them before I painted it...weird! Do you think some distressing ink might help it? That thought just popped in my head. I think I need to try that....I'll be right back. OK...I'm back! That was a 5 minute fix and I like it better now. It will do for a while and then I will give it another makeover! What do you think? You can be honest...it won't hurt my feelings a bit! That's it for today folks! I am excited that I have had time to blog every evening this week. My boss has let us leave right after the students every day this week due to testing. She knows how stressful it is on us and helps us out by letting us leave early. I normally don't leave until close to 4 (even though we can leave at 3:15) or even later some days, so leaving at 2:40 has been sweet! Tomorrow is our last day of testing and I am so proud of my kiddos! They are doing great. It is amazing to watch the transformation of these little sweeties. Many of them didn't attend preschool and had never been exposed to the alphabet and numbers and some of those same kiddos are now reading! Almost all of my students are reading now....not just sounding out words, but actually reading! Insert big smile here...:) It amazes me what they are capable of! Hope you have a blessed Thursday friends. 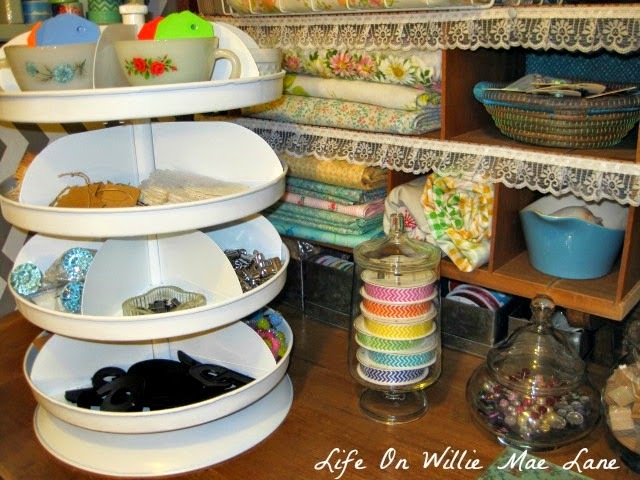 Earlier this week I shared a few tweaks I made to my craft room. Today after work, I tweaked another area. I was inspired to do this after creating this new banner for my window last night. 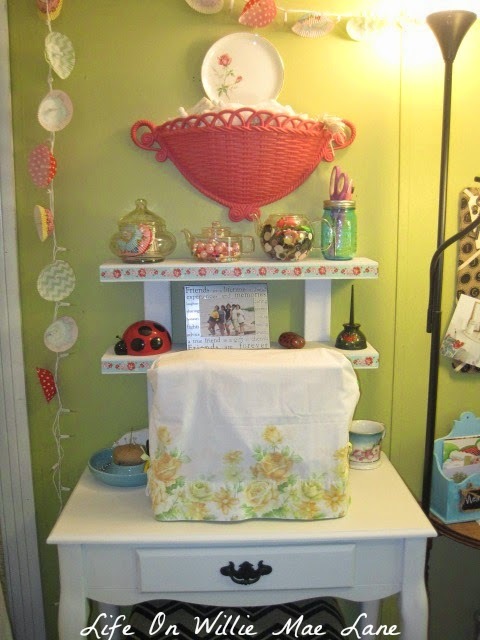 I have been seeing these cupcake liner and doily banners all over the web and finally decided to make one for myself. I had all the supplies on hand so it cost me nothing to make. It turned out super cute! I like the way it looks in the window with the light coming through. It was a little rainy and overcast when I took these photos earlier. Here's the corner of the room I tweaked. two shelves in this corner. One holds paint and fabric and the other holds items to list on Etsy. You may remember this little wooden, pedestal bowl I bought a few weeks ago. 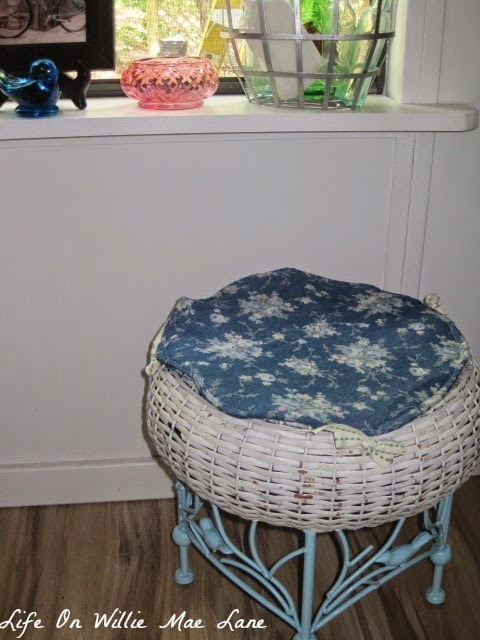 I gave it a paint job in sea glass and it sits atop the little table I also thrifted several weeks ago. I am still deciding on a paint color for the table. The wooden box under the window holds all my tools. Here's a shot of the two shelves. It's hard to get a good shot of the one holding the Etsy items, but it's OK since it's all cluttered. All 5 shelves are filled and I have 4 plastic totes filled under the guest room bed as wewll! See those two "wood" boxes above filled with paint? Those are just cardboard boxes covered with wood look wrapping paper. When you go to Sam's Club, they don't bag your items, but you can grab boxes to place your items in. 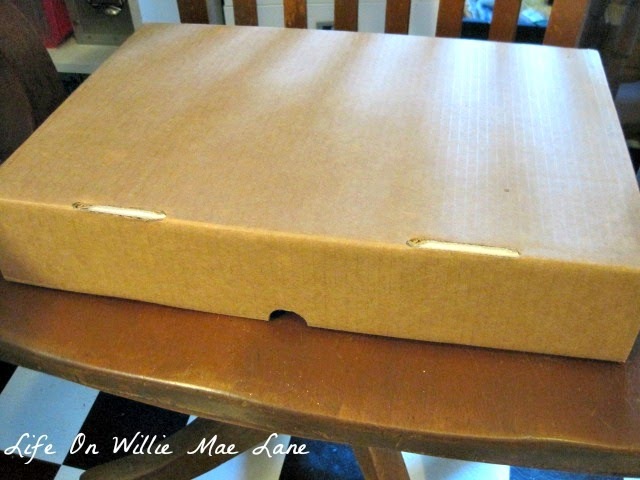 I always choose good boxes and reuse them if I can. They are perfect for my paints. I love my paints and use them often. One last look at the banner. Here's a close-up of each cupcake liner. I added a few little embellishments to each one. You can click on the picture and enlarge it if you want to see. 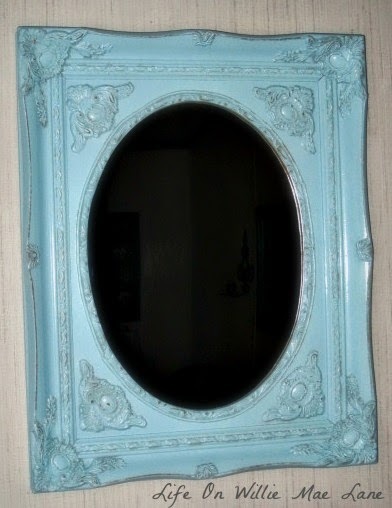 Hopefully I will be back tomorrow with my mirror makeovers. 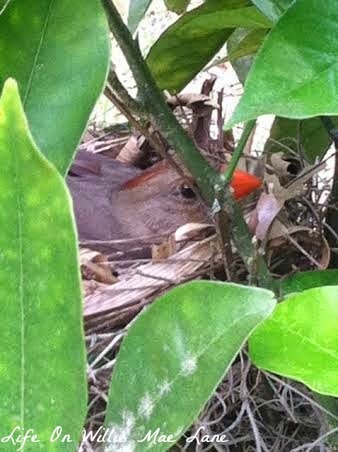 Spring is such a special time of year....it's the time when new life abounds. My kindergarten class had two caterpillars given to us by the pre-k department at our school. They were delivered in two tiny clear plastic cups with lids. After just a couple days, the caterpillars had attached themselves to the underside of the lid and turned into a chrysalis. Of course the kiddos thought this was amazing, and truly...it is! 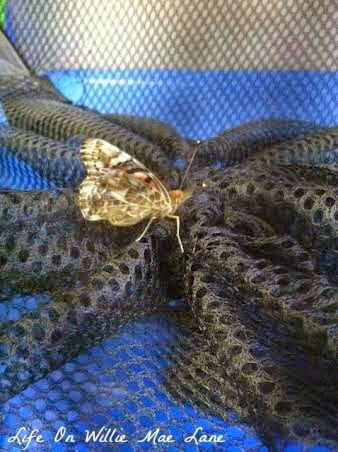 I didn't have a butterfly habitat so I brought a mesh pop-up hamper I had at home and attached the lids to the top so we could keep an eye on them. 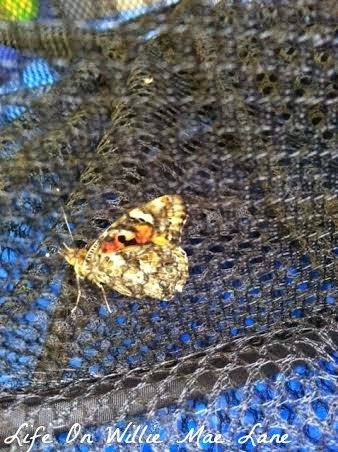 Well, just a few days later, one of my little girls ran up to me all excited because the butterfly had "hatched"....lol! Here is the sweet little butterfly. Unfortunately, our other one never emerged from it's chrysalis. I don't know why.....it looked like it was going to but never did. We took this one out today and opened up the bag and it flew out and away. This one is better. 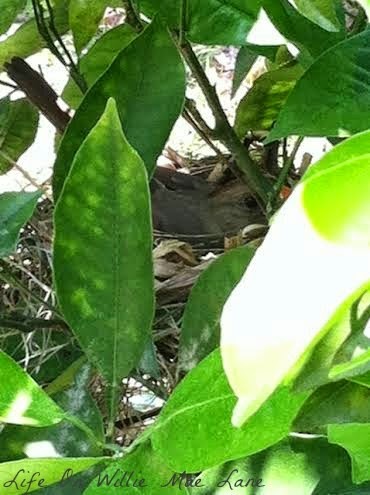 She let me get closer but after I got about 18 inches away, she flew out of the nest. I was very careful not to touch anything near the nest. I didn't want to risk her not returning. 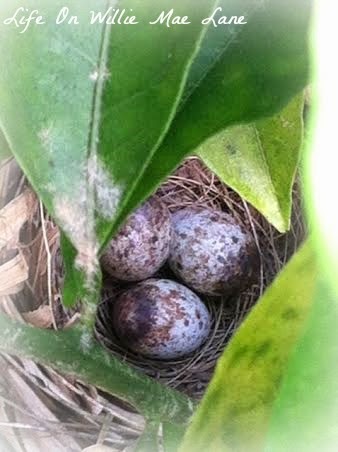 Look...how sweet are these little eggs.....each of them holding a new little life. 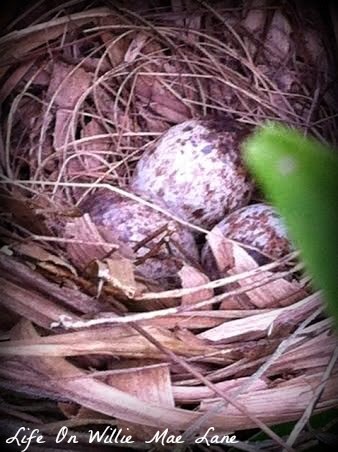 Hopefully nothing will harm them before they can hatch. I wanted to share a picture of my Yesterday Today and Tomorrow plant that I showed you Saturday. 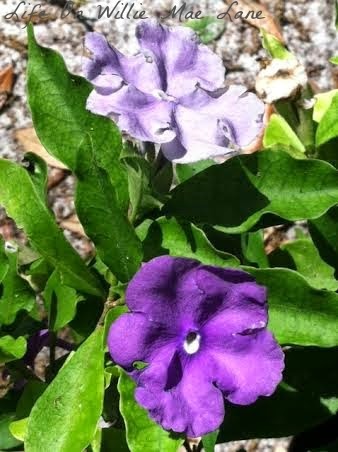 I just love these two shades of purple. Some of you may remember that I received some note cards from Cecilia in the ornament exchange I hosted last year. She's a very talented artist and has an awesome blog, The B Farm as well! You should check it out! Anywho, she knew I fell in love with this painting that was on one of the note cards. She ran across this one when she was moving some things and sent it to me. So sweet! Thanks so much Cecilia! I am so blessed to have so many awesome blog friends who leave me such sweet comments, offer up prayers when I ask for them, and are just great friends! Thanks to each and every one of you....I appreciate you ALL! Have a wonderful week and enjoy the simple things life has to offer! 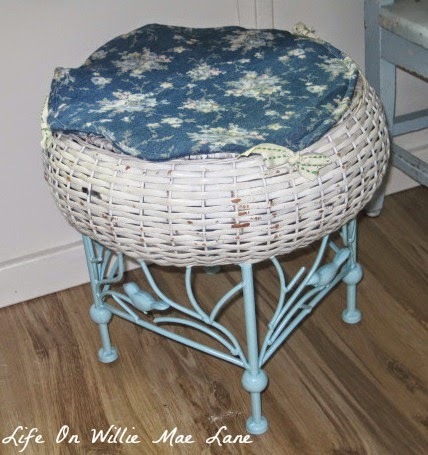 I started with the little stool I bought on yesterday's treasure hunt. I made a cover for the top because it was damaged. I also painted the base aqua blue. 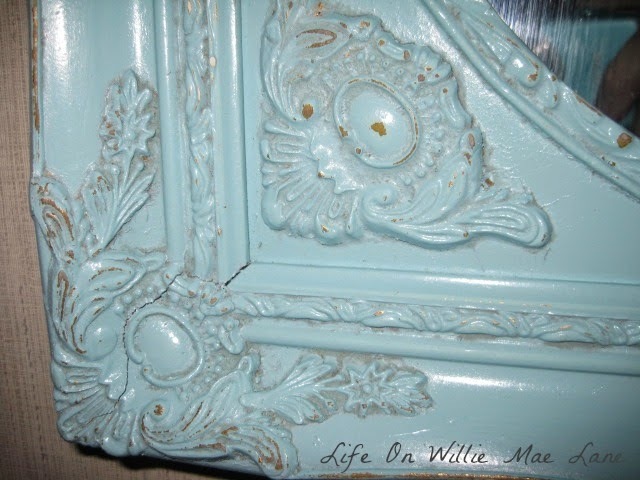 I like the way it turned out but I really wanted to paint it turquoise. I had a brand new can of paint too...and wouldn't you know, it wouldn't spray right. I switched the nozzle and it still didn't work, so I will exchange it next time I go to town. So bummed! I was too impatient to wait, so I chose aqua and switched fabrics and came up with this. I made the cover from a dress I purchased some time back just for the fabric. 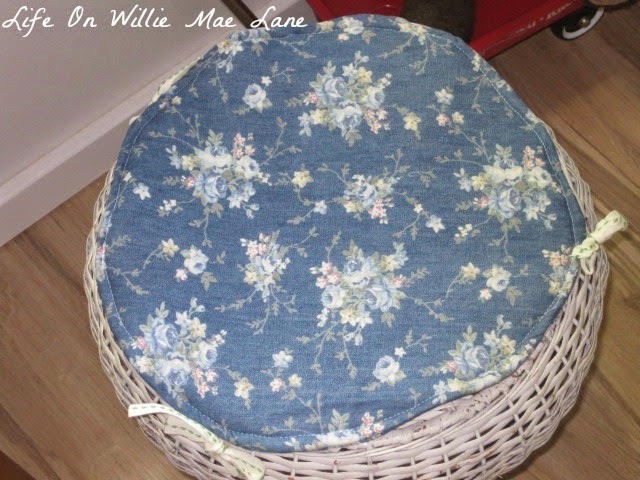 It is a lightweight denim with roses. So pretty and should be durable too. I didn't attach it permanently, so I can untie it to wash it when it gets dirty. 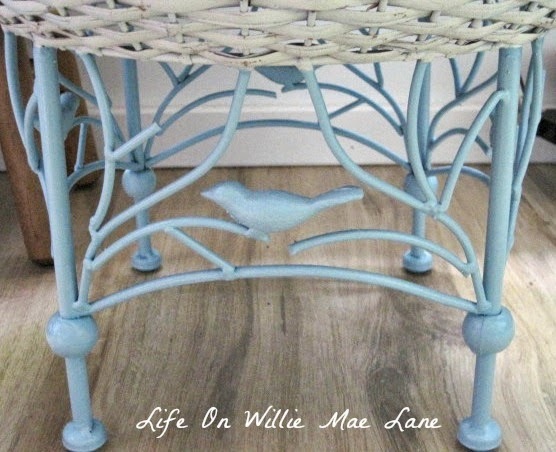 I didn't repaint the wicker, but am wondering if I should. It is a little shabby, but I think it looks OK. What do you think? For now it is in the guest room, but one day it will reside on my porch. After I finished that project, I decided to make a cover for my sewing machine. I've been meaning to do this forever and finally got around to it. I used a vintage pillowcase I thrifted recently. 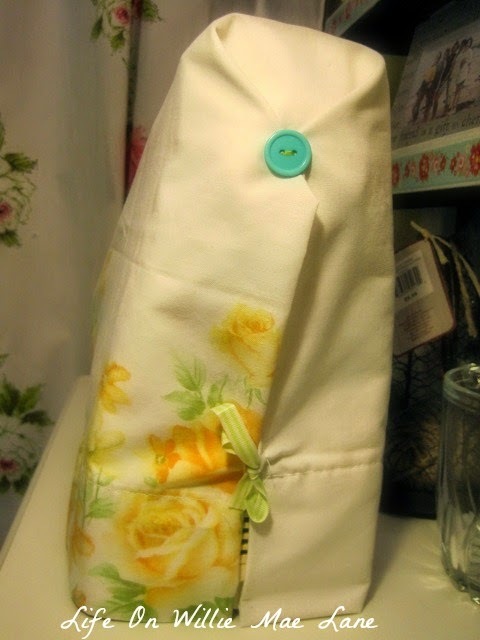 I added some buttons and ribbons to the sides to keep it closed. 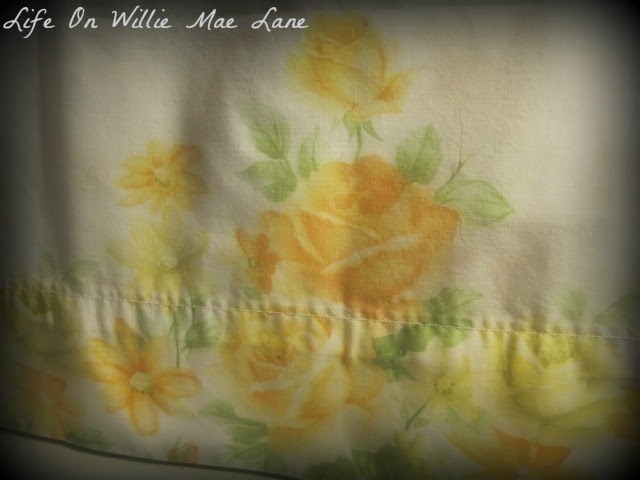 I love the yellow roses on this pillowcase. After that project was complete, I decided to do something with this box I brought home from school. It used to hold crayons. 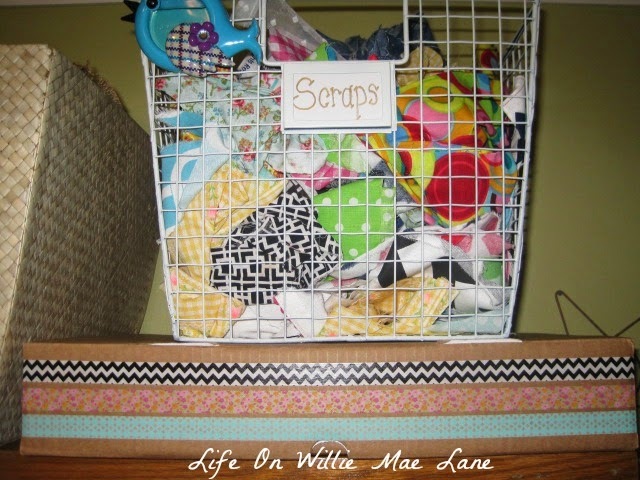 When I emptied it, I thought it would be perfect to hold bits and pieces in my craft room. I didn't want to cover it, so I unfolded it and turned it inside out and put it back together. I have done that before with other boxes and it is really easy. This box is very sturdy! I love the plain brown cardboard....and just look at all those compartments. I filled them all up! 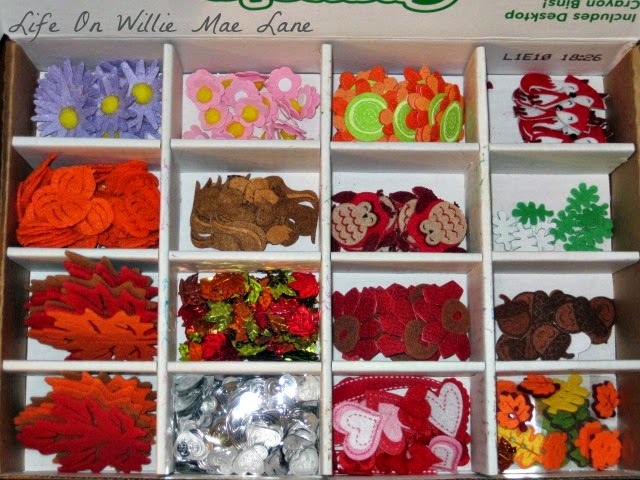 These are embellishments for crafting tags and such. 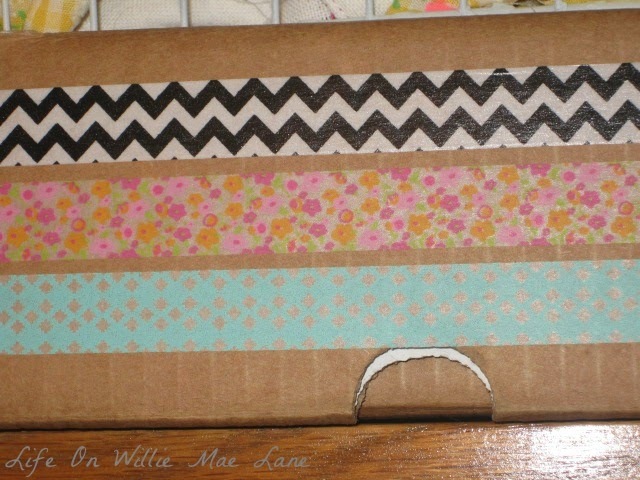 I wrapped some washi tape around it to dress it up a bit. And here it is on the shelf. 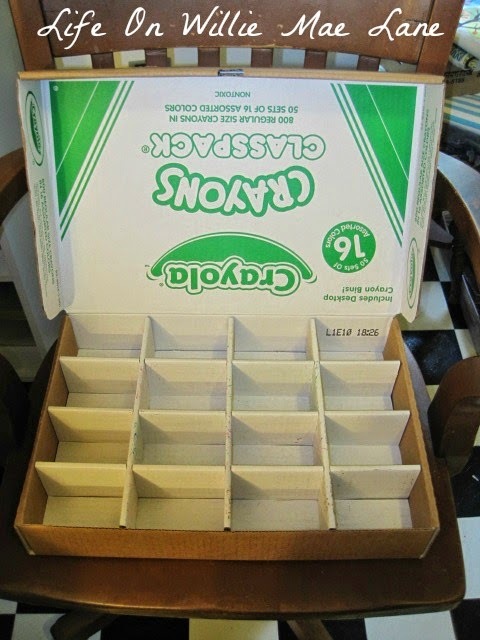 I have another one at school that has 10 compartments that is almost empty. 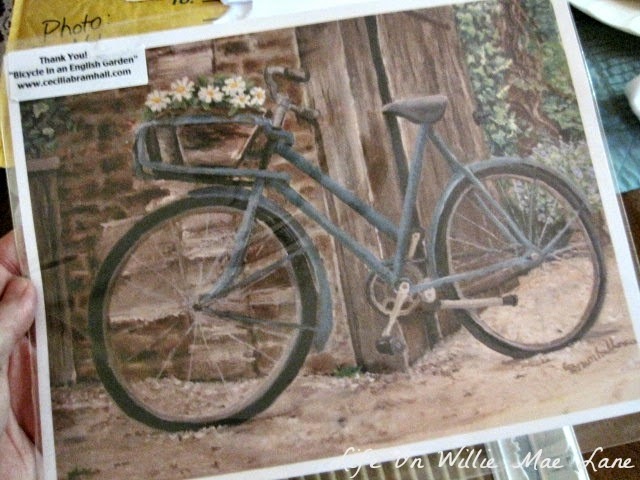 I will bring it home when I empty it and use it to hold more embellishements or maybe lace. In between crafting, I cleaned and reorganized my big desk. It was piled high with stuff that needed to be put away. You can see the Scrabble lazy Susan that I shared yesterday. Here is a close-up. 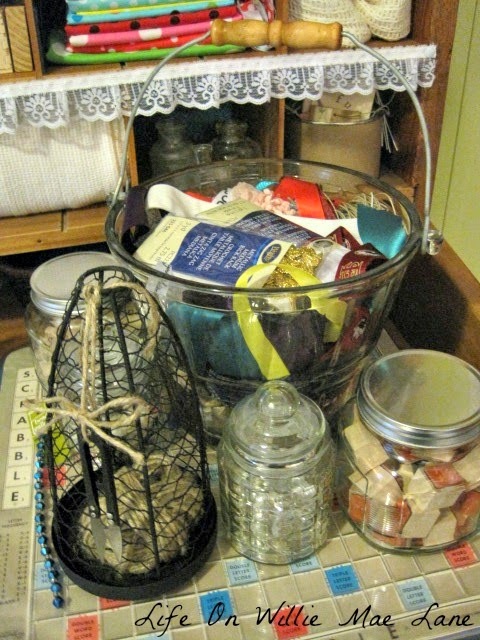 It holds my glass bucket filled with ribbon scraps and ric rac as well as my twine holder and some small jars filled with alphabet stamps and beads. 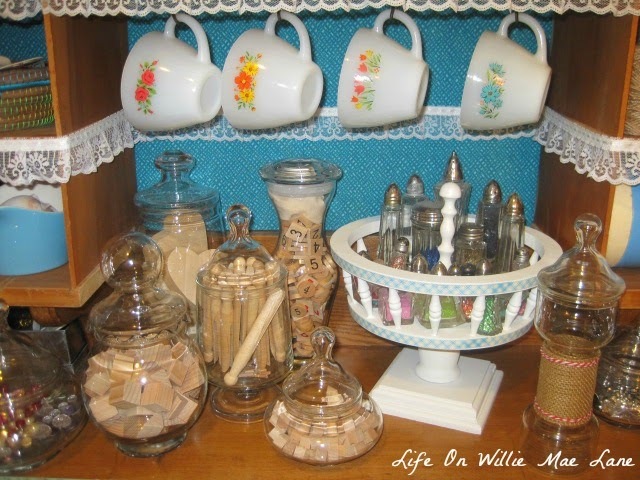 The center holds my glitter salt and pepper shakers and several apothecary jars filled with wood craft supplies. The left side holds my revolving bin and a jar filled with ribbon. 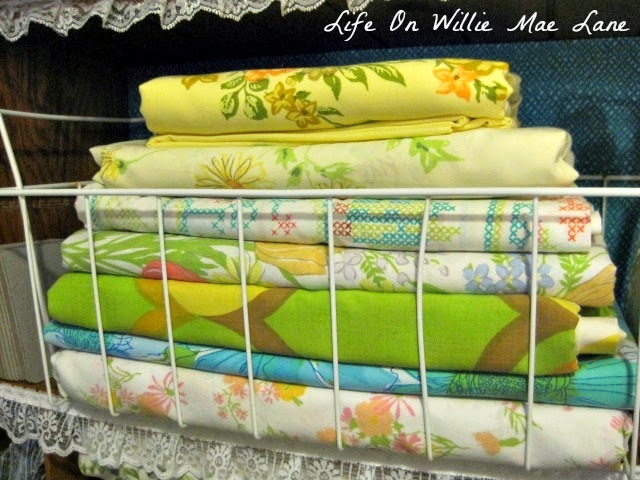 I just love the look of vintage sheets all stacked up. I have more in a cubby below the basket. 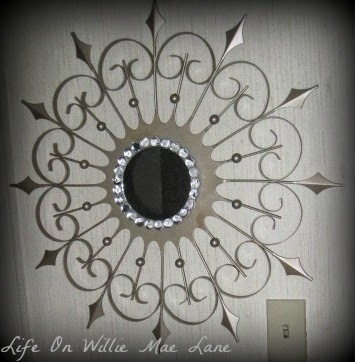 I worked on a couple mirror makeovers too but will share those later in the week since this post is getting long. 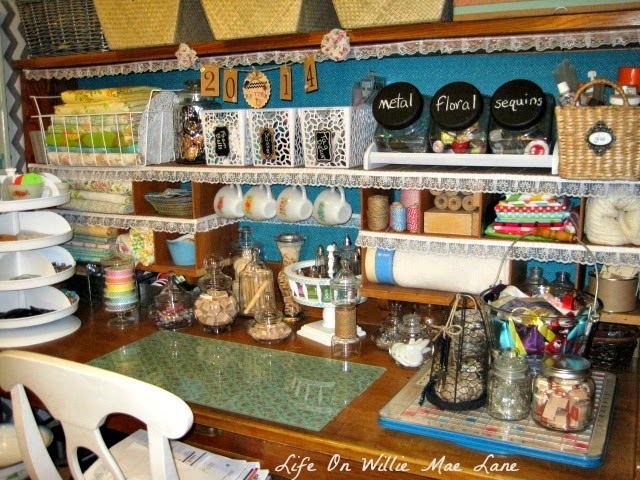 It felt good to get in my craft room today and clean it up, reorganize a bit, and get crafty! I have had so little time for it lately. 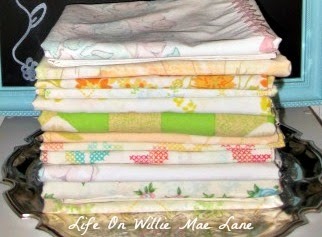 I hope to get back in there tomorrow night to reorganize my Etsy inventory. I have so many things and am running out of room for it all. I pray each of you has a blessed week. Thanks for stopping by! A Little of This & a Little of That!